My really good friends, Beth and Steve, live in Minnesota just west of Minneapolis. They have a gorgeous house and property on several acres. Their gardens are beautiful and they have worked hard on them over the years. I visited them earlier this summer and their gardens were so pretty and inviting. And they have taken up beekeeping. They have two hives that they tend to. Wow, did I learn a lot about bees. Who knew they were such fascinating little creatures? I didn’t know much about bees at all. Several times, at her kitchen window or in one of her sitting areas in her gardens, Beth would say, there’s one of our bees. I would ask her how she knew that and she would say she knows her bees. I believe her, they have hundreds of bees in those hives. Steve put on his protective bee clothing and showed me one of the hives. He pointed out the queen, showed me where they make and store the honey, explained to me about the worker bees and their jobs, and many other beekeeping tidbits. It was too early in the season for honey so I didn’t get to taste any. Like I said, fascinating. A couple of weeks ago it was my birthday and a box arrived from Beth and Steve. Can you guess what they sent me? Yep, a jar of honey! From their bees! Oh my gosh, just the best birthday present. I couldn’t wait to try it. 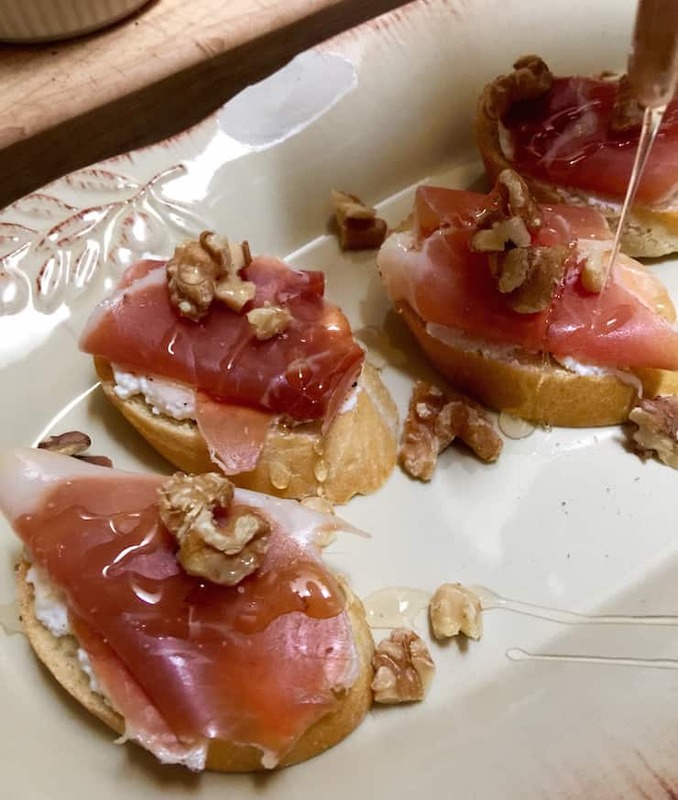 I was trying to think of something that would showcase this special honey and decided on crostini, toasted slices of bread with toppings, a great appetizer with some wine before dinner. I sliced up some baguette and toasted them in the oven. I like it kind of soft, especially for this. You can brush some olive oil on the slices if you want, or even grill them. Next came some good whole milk ricotta. I bought mine at a specialty grocer but if you’re so inclined, I hear homemade ricotta is very good. Make sure to seek out a good quality ricotta cheese. I slathered on the ricotta and then some fresh coarse-cracked ground pepper. Now the prosciutto. I tore off pieces and folded them onto the crostini. Lovely. 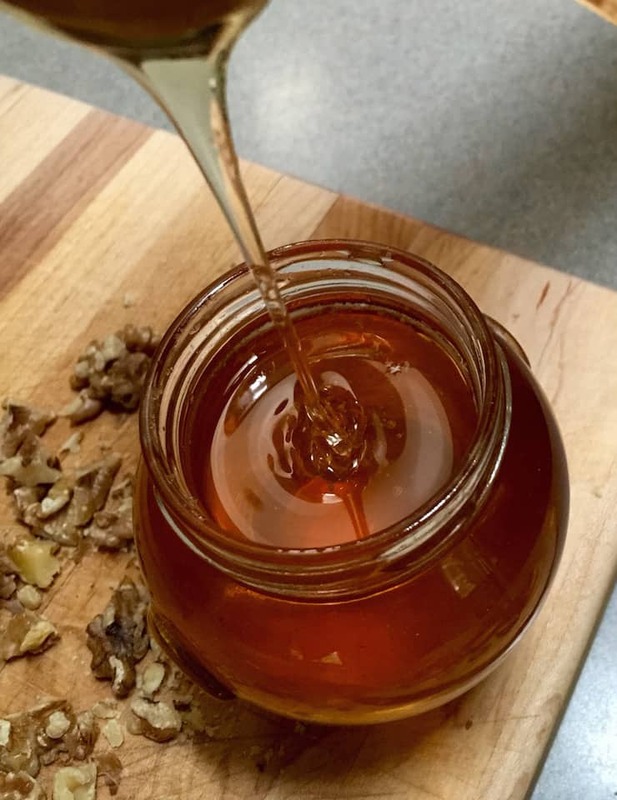 A sprinkle of toasted walnuts and then the star – the honey. I drizzled that beautiful honey all over the crostini. It looked so good. I enlisted Meathead’s help with taking some photos. I can’t always get the photo I want by myself, like the drizzle of honey. He was patient but then said we’re gonna eat this, right? I said I think I’m done and he wasted no time shoving three of them in his mouth. These are delicious. 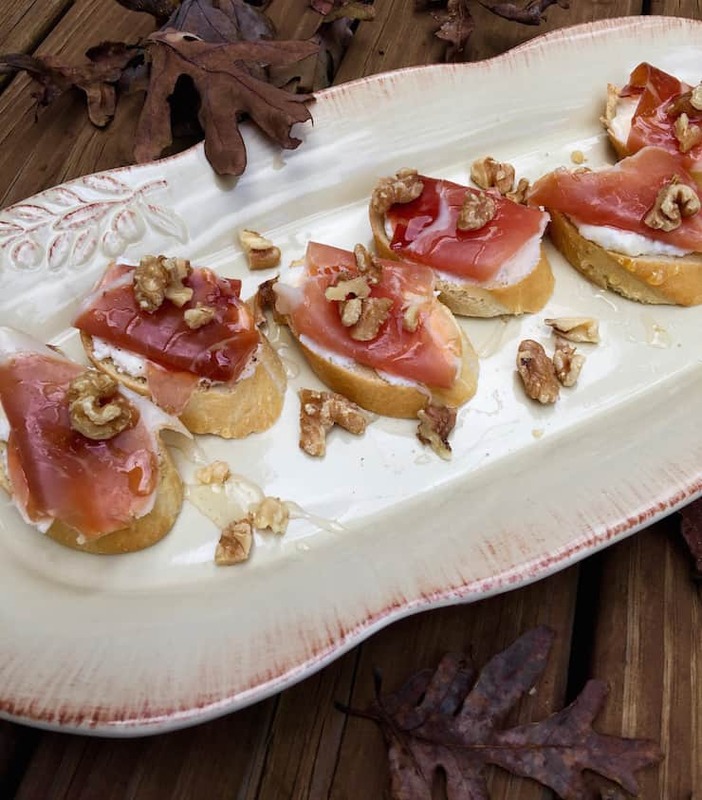 A great combination, the creamy ricotta, the salty prosciutto, the pepper and walnuts and the sweetness of the honey. 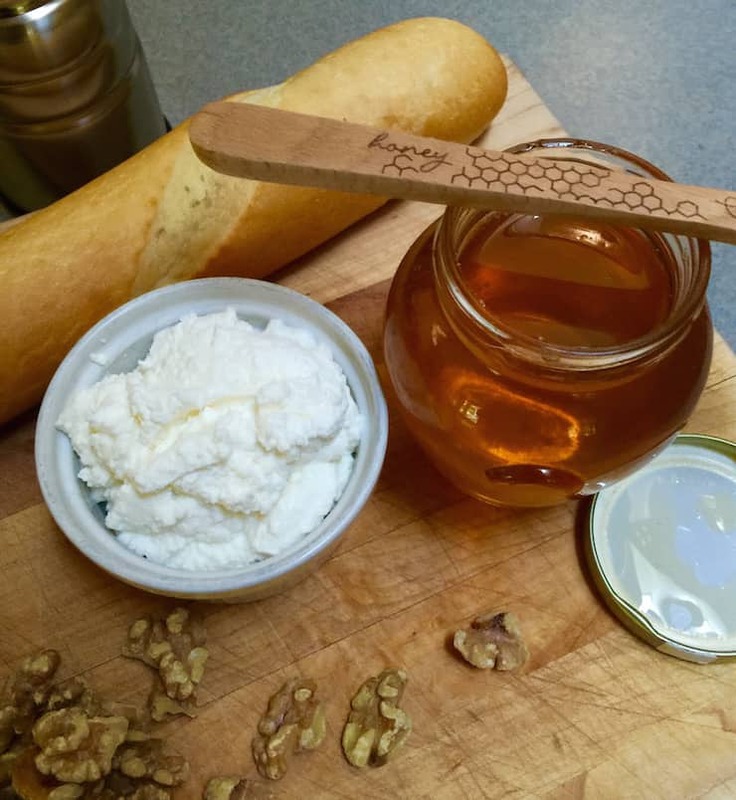 We think this honey is the best we’ve ever had, it was delicate and I’d say mild with a distinct flavor I couldn’t describe. I think maybe the type is clover, but I’ve not tasted clover honey this good. Your bees make some really terrific honey Beth and Steve. Thanks so much for sending some my way. I only wish I could be sitting with you guys around your fire pit, eating this crostini and swilling some wine. 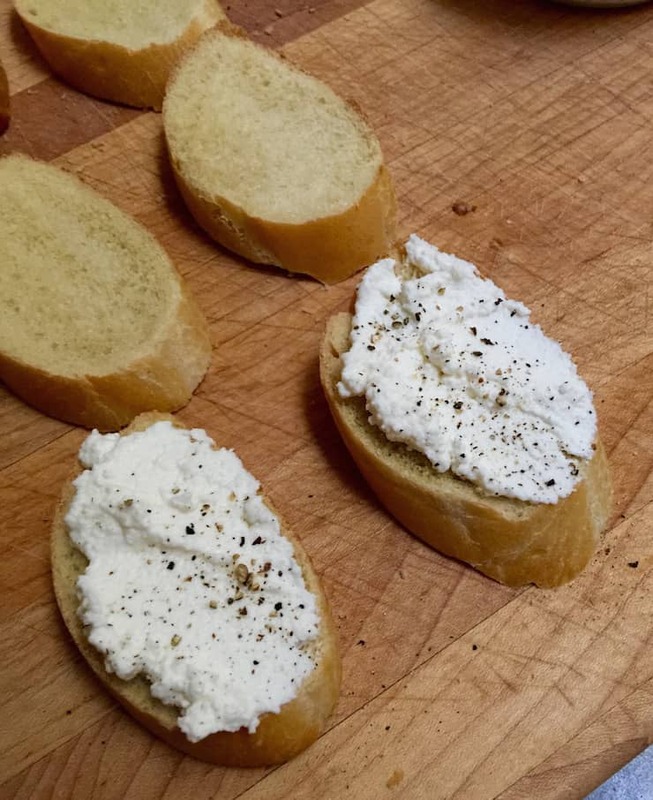 Spread each slice with a generous amount of ricotta and top with coarse ground pepper and arrange on a platter. Put folded pieces of prosciutto on top and sprinkle with chopped walnuts. 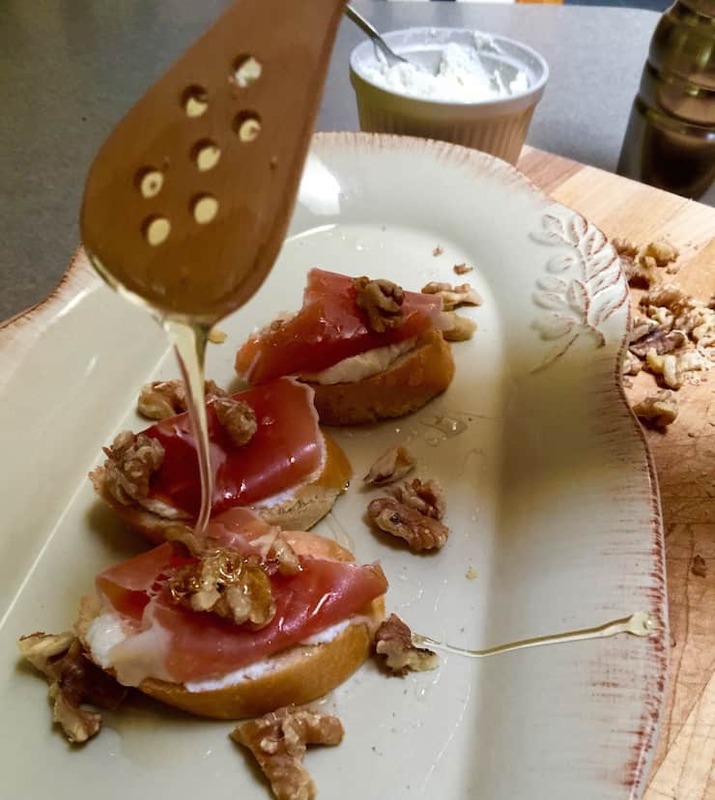 Drizzle honey over the crostini and serve. I had to force myself to stop at three. I believe you ate four. I’ve made these about 4 times now, which tells you it’s a huge hit. I’m with you Mark, it’s hard to stop! Yum. You have the best honey for these, big reason why they are so good.